Manchester United will defend their International Champions Cup title, the competition in which they set a USA attendance record for a football match. This summer's competition will include Chelsea, Barcelona, Fiorentina, Porto, PSG, LA Galaxy, New York Red Bulls, San Jose Earthquakes and Club America. 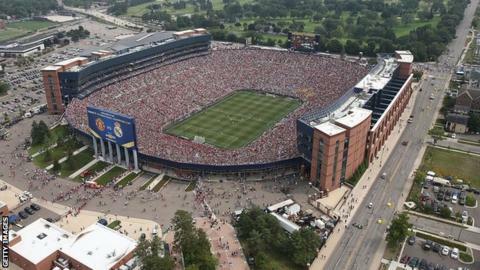 United and Real Madrid attracted a crowd of 109,318 to Michigan Stadium during last year's tournament. Louis van Gaal's side went on to beat Liverpool in the final on 4 August. None of the fixtures, dates and venues have yet to be confirmed by organisers. Last summer's tournament, which featured Manchester City, finished 12 days before the start of the Premier League season.